For other biblical books called "Esdras", see Esdras. Illustration of the triple-headed eagle from Ezra's vision (head-piece from Bowyer Bible, Apocrypha, 1815). 2 Esdras (also called 4 Esdras, Latin Esdras, or Latin Ezra) is the name of an apocalyptic book in many English versions of the Bible (see Naming conventions below). Its authorship is ascribed to Ezra, a scribe and priest of the 5th century BCE, although modern scholarship places its composition between 70 and 218 CE. :37 It is reckoned among the apocrypha by Roman Catholics, Protestants, and most Eastern Orthodox Christians. 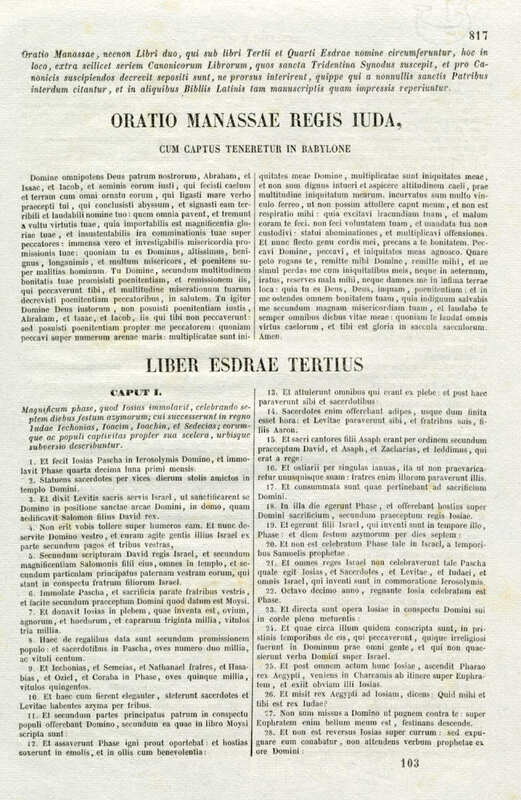 Although Second Esdras was preserved in Latin as an appendix to the Vulgate and passed down as a unified book, it is generally considered to be a tripartite work. As with 1 Esdras, there is some confusion about the numbering of this book. The Vulgate of Jerome includes only a single book of Ezra, but in the Clementine Vulgate 1, 2, 3 and 4 Esdras are separate books. Protestant writers, after the Geneva Bible, called 1 and 2 Esdras of the Vulgate Ezra and Nehemiah, and called 3 and 4 Esdras of the Vulgate 1 and 2 Esdras, which became common in English Bibles. Ambrose refers to this book as 'Third Esdras', as likely too did Jerome. Medieval Latin manuscripts denoted it 4 Esdras, which to this day is the name used for it in modern critical editions, which are typically in Latin, the language of its most complete exemplars. It appears in the Appendix to the Old Testament in the Slavonic Bible, where it is called 3 Esdras, and the Georgian Orthodox Bible numbers it 3 Ezra. This text is sometimes also known as Apocalypse of Ezra (chapters 3–14 known as the Jewish Apocalypse of Ezra or 4 Ezra, chapters 1–2 as 5 Ezra, and chapters 15–16 as 6 Ezra). The first two chapters of 2 Esdras are found only in the Latin version of the book, and are called 5 Ezra by scholars. They are considered by most scholars to be Christian in origin; they assert God's rejection of the Jews and describe a vision of the Son of God. These are generally considered to be late additions (possibly third century) to the work. Chapters 3–14, or the great bulk of 2 Esdras, is a Jewish apocalypse also sometimes known as 4 Ezra, or the Jewish Apocalypse of Ezra. The latter name should not be confused with a later work called the Greek Apocalypse of Ezra. The Ethiopian Church considers 4 Ezra to be canonical, written during the Babylonian captivity, and calls it Izra Sutuel (ዕዝራ ሱቱኤል). It was also often cited by the Fathers of the Church. In the Eastern Armenian tradition it is called 3 Ezra. It was written in the late 1st century CE following the destruction of the Second Temple. Among Greek Fathers of the Church, 4 Ezra is generally cited as Προφήτης Ἔσδρας Prophetes Esdras ("The Prophet Ezra") or Ἀποκάλυψις Ἔσδρα Apokalupsis Esdra ("Apocalypse of Ezra"). Most scholars agree that 4 Ezra was composed in Hebrew, which was translated into Greek, and then to Latin, Armenian, Ethiopian and Georgian, but the Hebrew and Greek editions have been lost. Slightly differing Latin, Syriac, Arabic, Ethiopic, Georgian, and Armenian translations have survived; the Greek version can be reconstructed, though without absolute certainty, from these different translations, while the Hebrew text remains more elusive. 4 Ezra consists of seven visions of Ezra the scribe. The first vision takes place as Ezra is still in Babylon. He asks God how Israel can be kept in misery if God is just. The archangel Uriel is sent to answer the question, responding that God's ways cannot be understood by the human mind. Soon, however, the end would come, and God's justice would be made manifest. Similarly, in the second vision, Ezra asks why Israel was delivered up to the Babylonians, and is again told that man cannot understand this and that the end is near. In the third vision Ezra asks why Israel does not possess the world. Uriel responds that the current state is a period of transition. Here follows a description of the fate of evil-doers and the righteous. Ezra asks whether the righteous may intercede for the unrighteous on Judgment Day, but is told that "Judgment Day is final". The next three visions are more symbolic in nature. The fourth is of a woman mourning for her only son, who is transformed into a city when she hears of the desolation of Zion. Uriel says that the woman is a symbol of Zion. The fifth vision concerns an eagle with three heads and twenty wings (twelve large wings and eight smaller wings "over against them"). The eagle is rebuked by a lion and then burned. The explanation of this vision is that the eagle refers to the fourth kingdom of the vision of Daniel, with the wings and heads as rulers. The final scene is the triumph of the Messiah over the empire. The sixth vision is of a man, representing the Messiah, who breathes fire on a crowd that is attacking him. This man then turns to another peaceful multitude, which accepts him. The "seventy" might refer to the Septuagint, most of the apocrypha, or the lost books that are described in the Bible. Most Latin editions of the text have a large lacuna of seventy verses between 7:35 and 7:36 that is missing due to the fact that they trace their common origin to one early manuscript, Codex Sangermanensis I, which was missing an entire page. In 1895 Robert Lubbock Bensly and James published a critical edition restoring the lost verses; it is this edition that is used in the Stuttgart edition of the Vulgate. The restored verses are numbered 7:35 to 7:105, with the former verses 7:36–7:70 renumbered to 7:106–7:140. For more information, see the article Codex Sangermanensis I.
and then shalt thou hear as much as thine ears may comprehend. and art called with the Highest and so are but few. But tomorrow at night thou shalt remain here and so shall the Highest show thee visions of the high things which the Most High will do unto them that dwell upon earth in the last days. So I slept that night and another like as he commanded me (2 Esd. 10:55–59). The last two chapters, also called 6 Ezra by scholars, and found in the Latin, but not in the Eastern texts, predict wars and rebuke sinners. Many assume that they probably date from a much later period (perhaps late third century) and may be Christian in origin; it is possible, though not certain, that they were added at the same time as the first two chapters of the Latin version. It is possible that they are Jewish in origin, however; 15:57–59 have been found in Greek, which most scholars agree was translated from a Hebrew original. The main body of the book appears to be written for consolation in a period of great distress (one scholarly hypothesis is that it dates to Titus' destruction of the Second Temple in 70 CE). The author seeks answers, similar to Job's quest for understanding the meaning of suffering, but the author doesn't like or desire only the answer that was given to Job. Critics question whether even the main body of the book, not counting the chapters that exist only in the Latin version and in Greek fragments, has a single author. Kalisch, De Faye, and Charles hold that no fewer than five people worked on the text. However, Gunkel points to the unity in character and holds that the book is written by a single author; it has also been suggested that the author of II Esdras wrote the Syriac Apocalypse of Baruch. In any case, the two texts may date from about the same time, and one almost certainly depends on the other. Critics have widely debated the origin of the book. Hidden under two layers of translation it is impossible to determine if the author was Roman, Alexandrian, or Palestinian. The scholarly interpretation of the eagle being the Roman Empire (the eagle in the fifth vision, whose heads might be Vespasian, Titus and Domitian if such is the case) and the destruction of the temple would indicate that the probable date of composition lies toward the end of the first century, perhaps 90–96, though some suggest a date as late as 218. The book is considered one of the gems of Jewish apocalyptic literature. Except for the Orthodox Slavonic Bible (Ostrog Bible, Elizabeth Bible, and later consequently Russian Synodal Bible), it was not received into European Christian canons. The chapters corresponding to 4 Ezra, i.e. 2 Esdras 3–14, make up the Book of II Izra, aka Izra Sutuel, canonical in the Ethiopian Orthodox Church; it was also widely cited by early Fathers of the Church, particularly Ambrose of Milan. It may also be found in many larger English Bibles included as part of the Biblical Apocrypha, as they exist in the King James version, the Revised Standard Version, and the earliest editions of the Catholic Douay-Rheims Bible, among others. The introitus of the traditional Requiem Mass of the Extraordinary Form of the 1962 Missal in the Catholic Church is loosely based on 2:34–35: "Eternal rest grant unto them, O Lord, and let perpetual light shine upon them." Several other liturgical prayers are taken from the book. The same chapter, verses 36 and 37, is cited in the Introit of Pentecost Tuesday, “Accipite jucunditatem gloriae vestrae, alleluia: gratias agentes Deo, alleluia: qui vos ad caelestia regna vocavit, alleluia, alleluia, alleluia. Ps. 77 Attendite, popule meus, legem meam: inclinate aurem vestram in verba oris mei. Gloria Patri. Accipite. – Receive the delight of your glory, alleluia, giving thanks to God, alleluia, Who hath called ye to the heavenly kingdoms, alleluia, alleluia, alleluia. Psalm 77 Attend, O my people, to my law: incline your ears to the words of my mouth. Glory be. Receive.” Jerome states that it is apocryphal along with 3 Esdras. Clement VIII placed it in an appendix to the Vulgate along with 3 Esdras and the Prayer of Manasseh "lest they perish entirely". Christopher Columbus quoted verse 6:42, which describes the Earth as being created with 6 parts land and 1 part water, in his appeal to the Catholic Monarchs for financial support for his first voyage of exploration. ^ 4 Ezra is the title used in modern English translations as in Charlesworth's (ISBN 978-0-385-09630-0). See also bibliography there. ^ a b Stone, Michael Edward (1990). Fourth Ezra; A Commentary on the Book of Fourth Ezra. Hermeneia. Fortress Press. ISBN 978-0-8006-6026-0. ^ For example, it is listed with the apocrypha in the Anglican Thirty-Nine Articles of Religion. ^ Metzger, B. M. "The Fourth Book of Ezra". In J. Charlesworth, ed., The Old Testament Pseudepigrapha. vol 1, p. 517ss. ^ a b Theodore A. Bergren (2010). Michael D. Coogan (ed.). The New Oxford Annotated Apocrypha: New Revised Standard Version. New York, USA: Oxford University Press. pp. 317–318. ISBN 9780195289619. ^ Wong, A. C. K.; Penner, K. M.; Miller, D. M. (2010). "4 Ezra". The Online Critical Pseudepigrapha. Atlanta: The Society of Biblical Literature. Retrieved April 12, 2019. ^ Biblia Sacra Vulgata, 4th edition, 1994, ISBN 3-438-05303-9. ^ Actual Apocrypha in the Liturgy. ^ "St. Jerome, The Prologue on the Book of Ezra: English translation". ^ Longenecker, Bruce W. (1995). Two Esdras. A&C Black. p. 112. ISBN 9781850757269. "Ezra, Fourth Book of" . Encyclopædia Britannica (11th ed.). 1911. King James version of 2 Esdras.